Posted in: Junior Tennis, USTA. Tagged: 14s, 14u, 2013, california, Championship, junior, national, North Carolina, San Diego, South Carolina, Team Tennis, usta, Wilmington. CAYCE, S.C (Oct. 21, 2013) — Two teams were crowned Sunday at the 2013 USTA Jr. 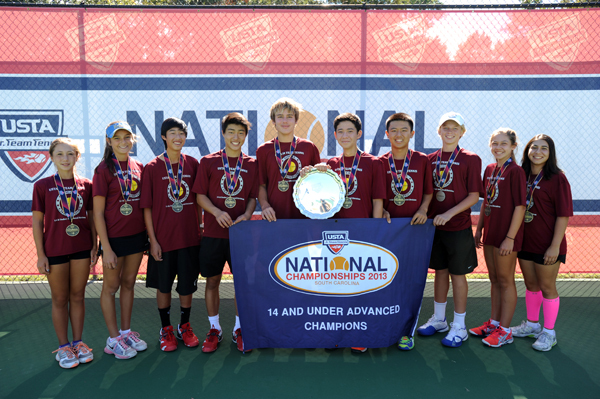 Team Tennis 14U National Championships, held at the Cayce Tennis and Fitness Center in Cayce, S.C., Oct. 18 – 20. A team from Wilmington, N.C., representing the USTA Southern Section, captured the Intermediate Division title while a team from San Diego, Calif., representing USTA Southern California, earned the Advanced title. 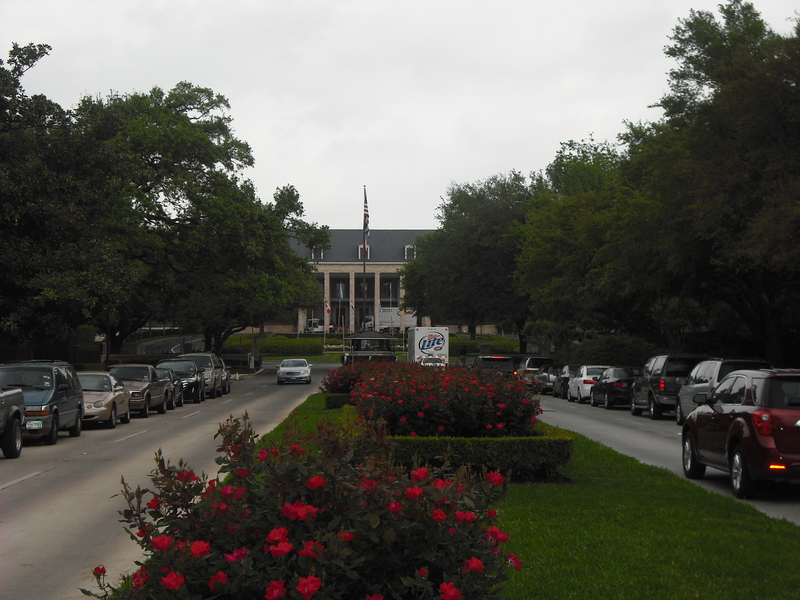 The 2013 USTA Jr. 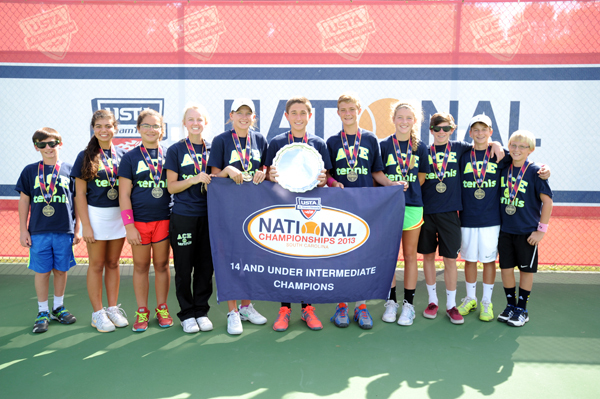 Team Tennis 14U National Championships brought together the top 32 teams at the Advance and Intermediate level from various USTA Sections throughout the country. The Wilmington team, defeated a team from San Diego, Calif., 56 games to 44 in the Championship match. Earlier in the tournament, they defeated a team from Oklahoma City, Ok. 50-34 in the semifinals. The team is coached by Lauren Isenhour and Jon Ingham and features: Keegan Bigoness, Lila Das, Lexi Lampkin, PJ Middleton, Taylor Walicki, Patrick Senior, Holland Baynard, Kara Ferner, Eddie Janosko, Robert Schuett and Westley Gaines. The San Diego team, defeated a team from Providence, R.I., 50 games to 37 in the Championship match. Earlier in the tournament, they defeated a team from Ocean Springs, Ms., 56-34 in the semifinals. The team is coached by Solomon Liu and features: Jennifer Kerr, Julia Ronney, Andrew Hu, Robert Liu, Kiev Moores, Nicholas Appel, Timothy Sah, Ryan Seggerman, Nicole Mossme and Olia Javidi. Washington Kastles Are Kings Again! 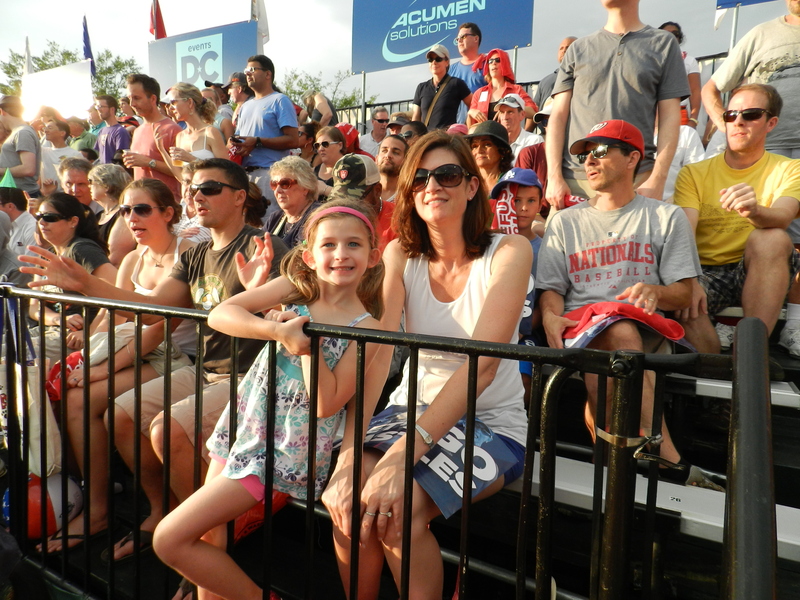 The Kastles sent the 2013 WTT season off in style last night in front of a sold out crowd at Kastles Stadium at the Wharf in Washington DC. They won their third WTT Championship in a row, this time over the Springfield Lasers by a score of 25-12. That’s a blowout in WTT parlance, and was the largest victory margin in a WTT Final in 11 years. A two hour rain delay and a $2 beer offer was the perfect prescription for a boisterous partisan crowd. 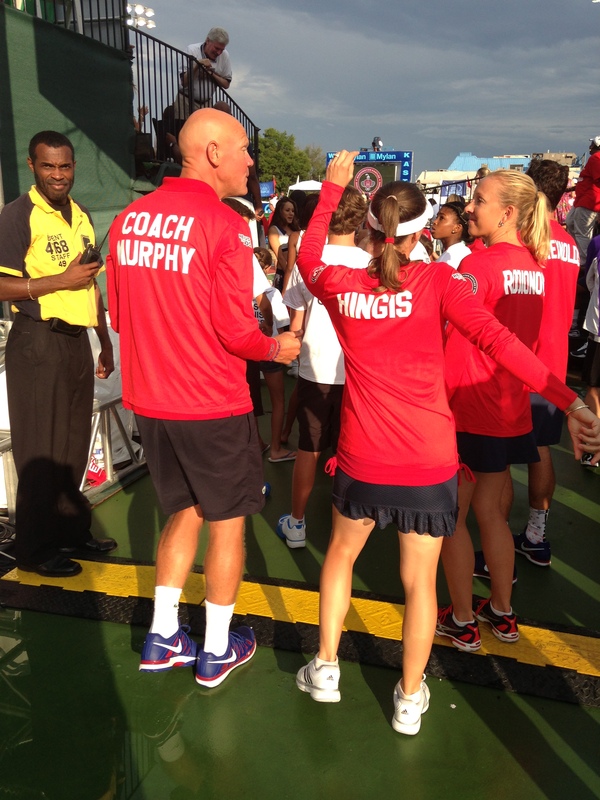 Though the beer eventually ran dry, the Kastles energy level did not, as they swept all five matches on the program. This marks the first time a team has taken all five matches in the Mylan WTT Finals since the league switched to a first to five games format in 1999. It was announced on Saturday that Springfield Lasers star Andy Roddick would not be playing singles in the Championship. The way Bobby Reynolds played last night, it would likely have made little difference in the final result. Reynolds, who was not surprisingly named the MVP of last night’s finals, set the tone early against Rik De Voest in singles. Bobby’s patience paid off as he broke DeVoest twice en route to a 5-1 victory. Just when you thought the score might tighten up, Martina Hingis and Anastasia Rodionova provided a comeback in their match as they were down 3-2 against Alisa Kleybanova and Vania King. Hingis and Rodionova grabbed the last three games to nab the match 5-3. Reynolds teamed up with Leander Paes in men’s doubles, and they faced little resistance from Andy Roddick and Jean-Julien Rojer with a 5-2 victory. Hall of Famer Martina Hingis then dispatched Alisa Kleybanova 5-2 and the feeling of inevitability swept over the crowd. 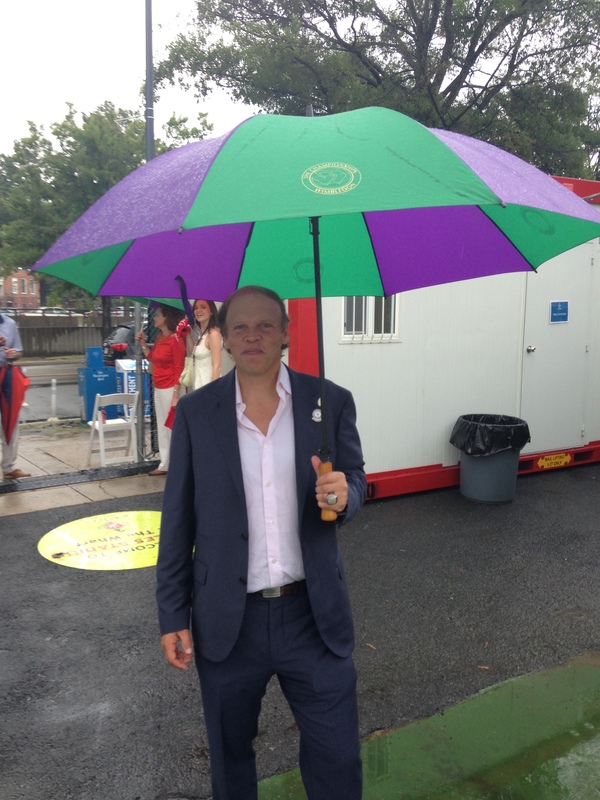 They came to see the Kastles hoist the King Cup, and the crowd that outwaited the rain knew they were in for a treat. Finally, Paes and Hingis eked out a competitive win against Roddick and Kleyanova 5-4 to close the door on Springfield. Under the WTT’s wacky overtime rules, it’s never over until it’s over. By winning the final match, it was celebration time right away. After an early retirement in 2007, it looks like Hingis could be back on court–both in World Team Tennis and WTA doubles—for some years to come. DJ Kool provided halftime entertainment for the fans. Earlier in the evening, I enjoyed listening to the Kastles media rep explaining the details of World Team Tennis to the entertainer. He seemed extremely receptive to the lesson. I mentioned the details of Hingis’ early retirement and he was truly fascinated. He seemed surprised that tennis players might have real-world problems, too. Last night’s championship match was the first time my wife saw World Team Tennis in person. Same goes for my daughter. I enjoyed both of their reactions. My wife had to get used to the noise, the announcers and the energy of a crowd at a wrestling match. My daughter needed no break-in period. Like I used to yell “Eddie! Eddie!’ at Memorial Stadium in Baltimore for Orioles first baseman Eddie Murray, she was still screaming “Bobby! Bobby!’ out of the car window on the way home. Kastles staff and owner Mark Ein have done everything possible to make this team and the venue a showcase for tennis in our Nation’s Capital. DC may not be a tennis town like Atlanta or Charleston, but in July, Washington is King of the Court. The main draw of the 2013 International Tennis Hall of Fame Championships in Newport, Rhode Island has 10 players who hail from the United States, and 4 out of the 5 left standing in Wimbledon after the first round will be playing on the New England grass in less than two weeks. John Isner, Denis Kudla, James Blake and Rajeev Ram are headed to Newport, but not until their business is finished in London. That’s because they all advanced to the second round at Wimbledon. Throw in our Canadian brothers Vasek Pospisil and Jesse Levine, who both made the second round, and that adds up to 6 of the 8 North American men left in Wimbledon are up next at Newport. Regardless of nationality, the top 15 seeded players for the HOF Championships posted a decent 10-5 record in the first round. In the finest performance yet at SW19 this year, Lleyton Hewitt made quick work of #11 Stan Wawrinka. Look out for him at the Newport Casino. James Blake was on fire against Thiemo De Bakker. Denis Kudla got his first Grand Slam win. And then there was Newport top seed Sam Querrey losing to Bernie Tomic. There are 13 days until main draw play begins at the American Wimbledon. Let’s hope one or more of these guys shows up a little late to Little Rhody because he was too busy playing quarterfinals at Wimbledon. 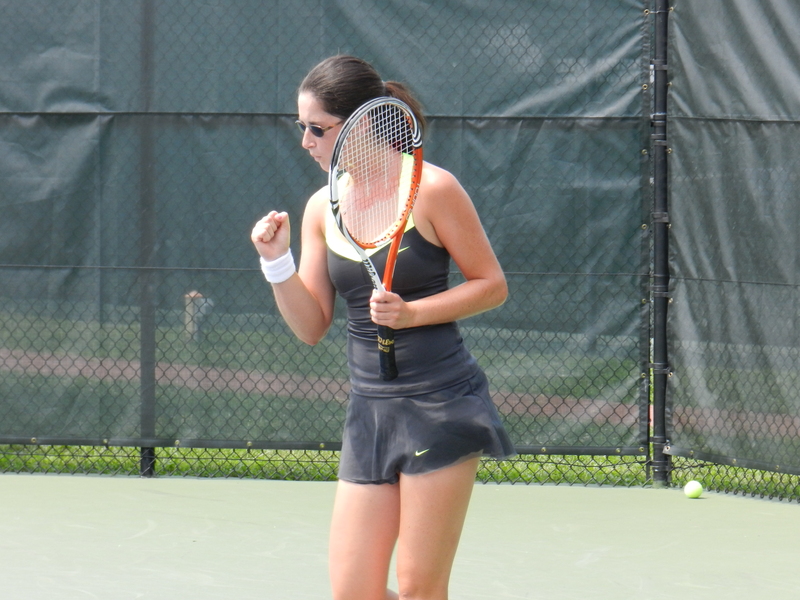 College Park, Md., June 14, 2013 – The Junior Tennis Champions Center of College Park will host the second-annual International Tennis Federation Grade 1 Junior International Hard Court Championship Aug. 19-24. The Grade 1 tournament will feature 64 boys and 64 girls in the expanded draw tournament. The tournament also features girl’s and boy’s doubles. The tournament kicks off in College Park on Aug. 9-11& with the USTA Hard Court Championship Wildcard Tournament which is open to all USTA players ages 18 and under. In addition, the Junior Tennis Champions Center will also host the USTA Hard Court Championship Qualifying Tournament Aug. 17-18 before the USTA Hard Court Championship on Aug. 19-24. This is the first time the Junior Tennis Champions Center will host a USTA Grade 1 tournament.